This is, like the last post, a little late to the blog. 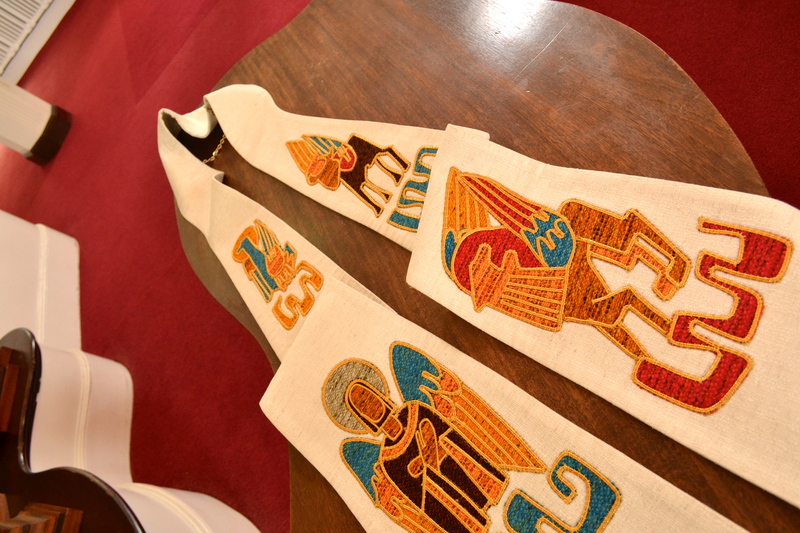 I wore this stole on Trinity Sunday, since the Trinity could be considered the theological backdrop of scripture. It’s a stole that G. gave me early in our relationship. 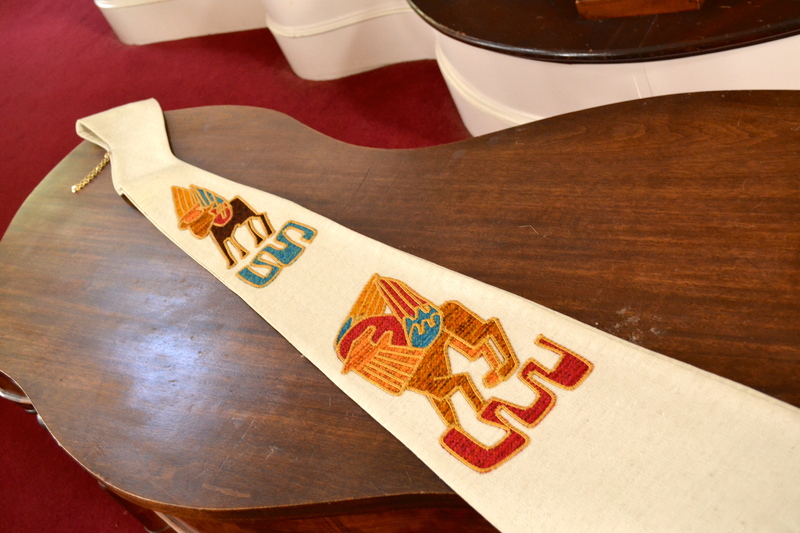 He found this stole, in all its woven glory, online from a Belgian maker. 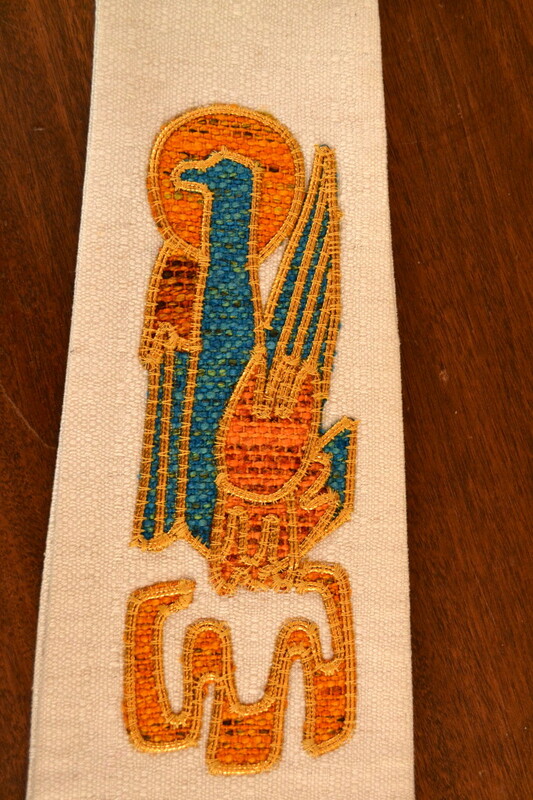 Its base color is white, and it features a striking, modern symbol for each of the Evangelists. In early Christianity, in a time few were able to read, the stories of our faith were told visually. Carvings, statues, and stained-glass creations were used to recount the stories in scripture or to lift up the early leaders, saints, and martyrs of the church. Among the most recognizable symbols were those for the four writers of the gospels. If you look around historic churches, you can often find the symbols in both prominent locations and tucked away in surprising places. In both the public and private parts of our lives, the gospel should remain at the center. Matthew, the first Gospel, starts with Jesus’ genealogy and seems to focus on his incarnation and human nature. The symbol for Matthew is a winged man or an angel. 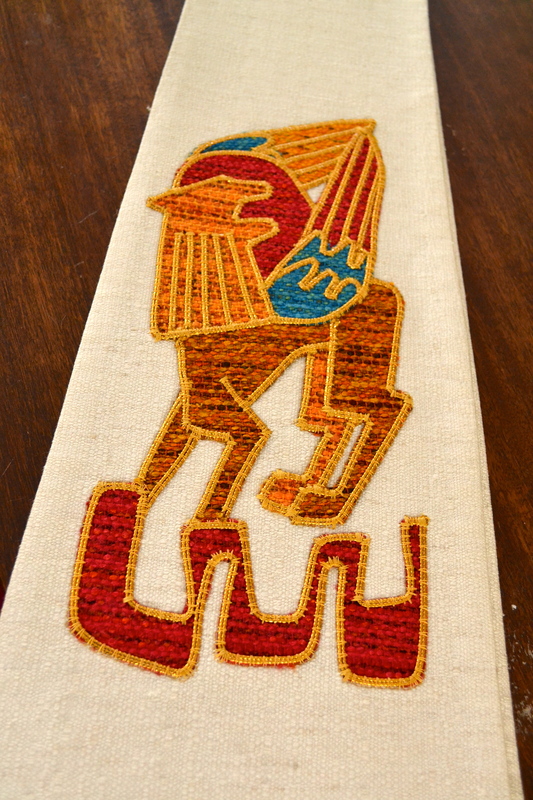 Mark, the oldest gospel, is represented by a symbol of courage and royalty: the winged lion. Interesting random connection: lions were thought to sleep with their eyes open–a representation of Christ in the tomb. Like the lion, we as Christians, strive to be courageous in our faith. 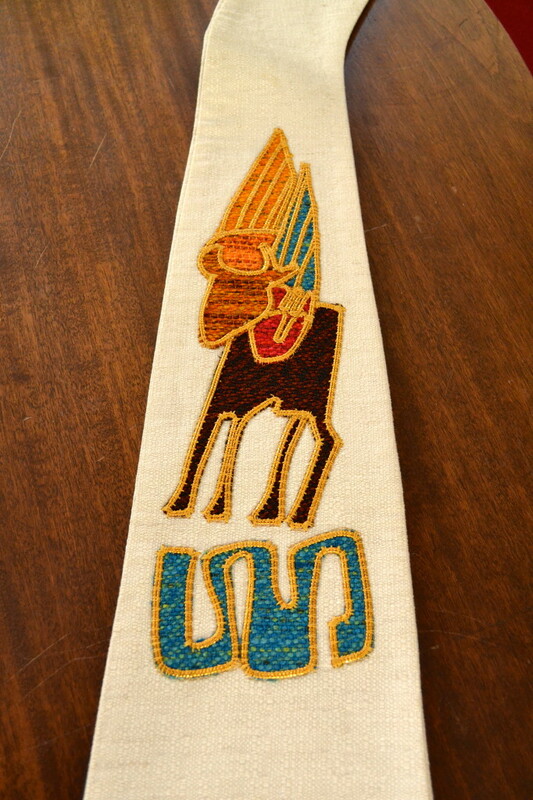 Luke, symbolized by a winged ox or winged bull–an animal used for sacrifices, points to Christ’s sacrifice to us. With this symbol, we are reminded of the own sacrifices we make. 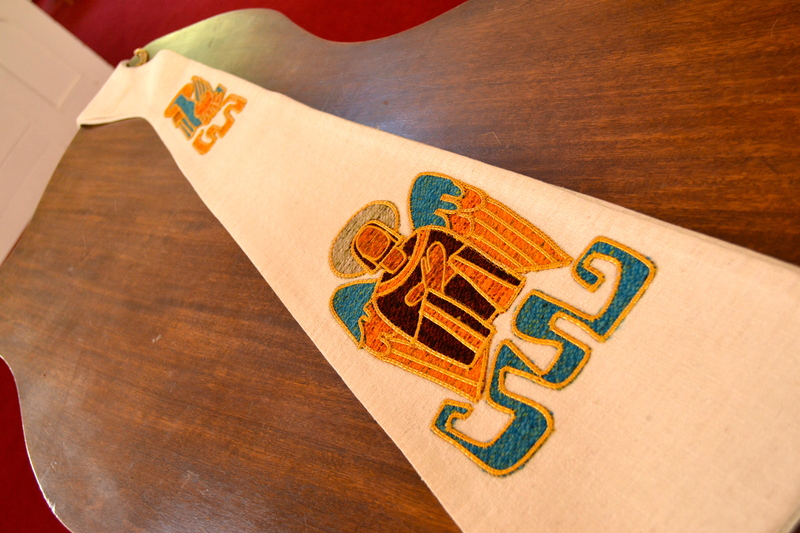 It is also a symbol of service and strength–to central themes in the Christian life. Finally, there is John. John’s symbol, often found carved into the lecterns where scripture is read in churches, is an eagle. Eagles, of course, can soar the highest of the four symbols and were said to be able to look directly into the sun. In the gospel of John, we find the author doing just that starting with the famous line: “In the beginning was the Word.” The eagle reminds us to strive for the higher goals of salvation and ultimate union with God. Of course like any symbol, these carry the meaning we give to them. So don’t be surprised to come across some differing interpretations. Want to read more? Check this website. In terms of the stole, there are two more things to note. The first is that it’s heavy. I’m not terribly aware that I’m wearing a stole most days. But when I wear this one, I know it! 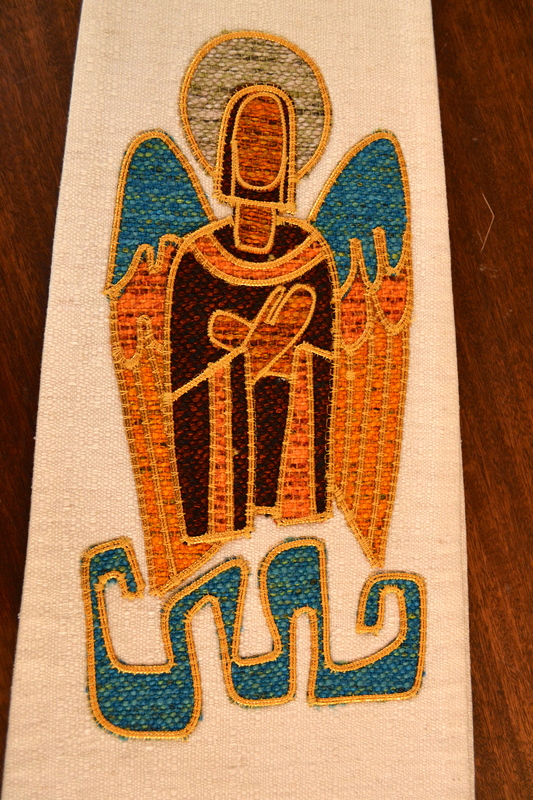 Secondly, I love the yoke of this stole. 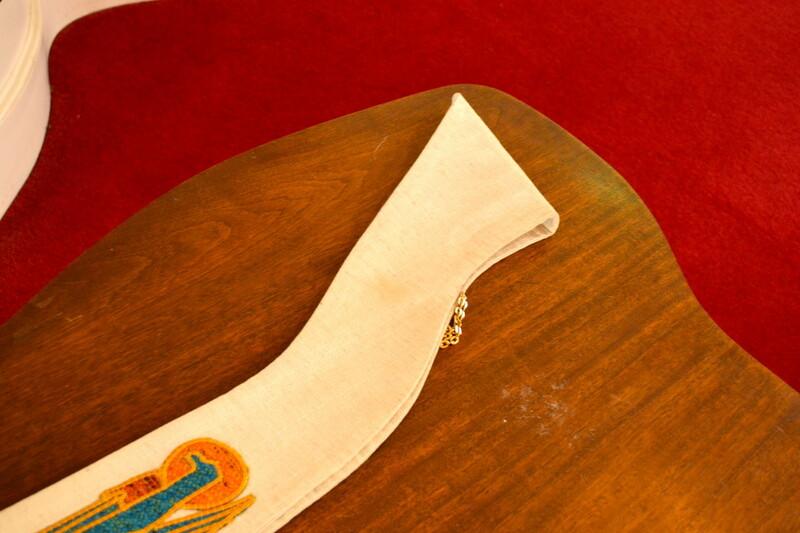 It’s soft curve enables the stole to hang just right. Where do you get all these beautiful stoles? Could you offer some links? Where did you get this stole? It is amazing! Join my mailing list to receive the latest posts about creative visuals in worship, sermons, & more from revjonchapman.com. I promise not to share you information with anyone else! Join my mailing list to receive the latest posts about creative visuals in worship, sermons, and more from revjonchapman.com.